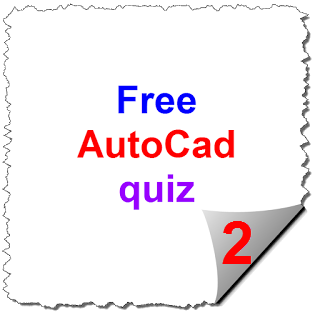 Free autocad test-autocad exams This Test (quiz) for how to use AutoCAD command which make users works sufficient and fast ,check your knowledge and will give refresh mind. these questions are free tutorials. Ace through your test by studying on a virtual desktop with CloudDesktopOnline along with an online backup of study materials accessible from your phone. Also, checkout cloud based apps from Apps4Rent. 1. If you modify a dimension style, all dimesions using that style in the drawing update automatically. 2. Changes made to a text style affect all text objects that use the style. 4.You can edit multine text, it becomes single line text. 5.If you explode multiline text, it becomes single line text. 6.The ID point command returns the coordinate of the point you select using the current units of the drawing. 9.When you use the join command to join lines, the line segments cannot overlap. 10. You can add layouts to your current drawing based on a layout in template file. 11.You can freeze the layer in the current viewport when the layout viewport is active. 12.If you create objects on layer 0, they cannot be moved to different layer. 13.Several running objects snaps are on,more than one object snap may be eligable at a given location. you can press the CTRL key to cycle through the possibilities before you specify the object snap. 14.When you stretch objects,you must define the stretch windows using a crossing window or crossing polygon. 15.While trimming, you select the portion of the objects to trim, not the portion to keep. 16. With Noun-verd selection turned on in the software, you can select the objects to move prior to starting the move command. 17. To remove the jog symbole from a jogged linear dimension, use the erase command and then the join command to clean up the gap. 18.When you use the join command to join lines< the line segments cannot overlap. 19.When using the MATCHPROP (Match properties) command, you can match properties from objects in one drawing to another drawing that is opened. 20.When using the MATCHPROP(match properties) command, you can select more than one source object.